Eye cancer is a cancerous growth which locates in any part of the eye. Some forms of eye cancer are primary, but others are the result of metastases from a primary cancer located somewhere else within the body. Compared to other types of cancerous tumors, eye cancer is rare. The American Cancer Society predicted that 2,090 people within the United States, in 2004, would be diagnosed with eye or orbit cancer with 180 people dying from it. Learning to recognize eye cancer symptoms early on can help soothe the conditions and minimize death risks. What Are Eye Cancer Symptoms? There are many possible symptoms of eye cancer, but it is important to remember that showing one of these eye cancer symptoms does not necessarily indicate cancer. They can also be a result of various other eye conditions, which is why you should always discuss them with your doctor. A change in their eye’s appearance. Partial or complete loss of sight. Bulging of the affected eye. A dark portion on the iris (the eye’s colored part) which grows. Blinkered vision, known as peripheral vision loss, which means you can clearly see objects straight ahead, but not those on the sides. Althoughpain in or by the eye is possible, it is rare and won't happen unless the cancer has already reached the exterior portion of the eye. Depending on the type of eye tumor, visual distortions may occur. You may see flash of light, wiggly lines, or spots in front of the eyes. It is possible for a tumor to distort the eye’s interior structures, leading to farsightedness. This symptom may also be provoked by choroidal hemangiomas or chronic lymphocytic leukemia spreading to the eyes. 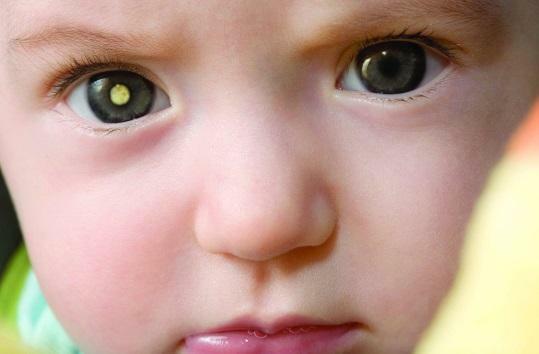 In children, the most frequent type of eye cancer is known as retinoblastoma, which affects 300 American children annually, typically those 2 years old or younger. In rare cases, it will include eye pain, but the more common eye cancer symptoms in children are misaligned or crossed eyes, pupils which are different colors, or a white pupil. This white spot in the pupil tends to be especially noticeable in photographs taken with flash. Note:It is important to remember that the sooner you notice cancer of any sort, the easier it will be to treat, increasing your chances of a successful treatment. As such, any time that you notice possible eye cancer symptoms, you should visit your doctor as soon as you can. Eye examination: During this exam, the doctor will look in your eye using a group of hand-held instruments while shining a light in the eye. They may also put some drops in the eyes, which can affect your vision for a brief period of time. Fluorescein angiogram: During this procedure, the doctor injects a dye in your arm, which then travels to your eyes’ blood vessels via your bloodstream. The dye appears on photographs and allows your doctor to examine the blood vessels within your eyes. Ultrasound: This examination involves moving a very small ultrasound sensor over the closed eyelid or perhaps on the skin surrounding the eye. The ultrasound relies on sound waves and generates an image representing the interior of your eye. MRI or CT Scan: These tests work to check the tissues and muscles both in and around the eye. MRI scans rely on radio waves and magnets to generate images of the body’s interior. CT scans use X-rays to create three-dimensional images of the body. Biopsy: The doctor may use a fine needle to collect a sample of fluid within your eye or that on the surface surrounding the eye. The fluid is then tested by a laboratory. In cases when your doctor suspects your eye cancer symptoms indicate skin cancer near the eye, they may give you a referral for a dermatologist, a doctor specializing in skin conditions. The treatment for eye cancer will depend on the size and advancement of the tumor. Eye removal, known as enucleation, is considered the most effective treatment option when the tumor has become advanced and doctors think that it's nearly impossible to regain vision. As this is a drastic form of treatment, it is typically avoided unless necessary. Choroidectomy: Remove a portion of the choroid. Iridectomy: Remove a portion of the iris. Iridocyclectomy: Remove a portion of the iris and the ciliary body. Iridotrabeculectomy: Remove a portion of the supporting tissues surrounding the iris and cornea. In cases of small tumors with good chances of vision being restored, there may be non-surgical treatment options as well. Chemotherapy and radiation both work to kill the existing tumor and stop it from spreading throughout the body. There are also specific anticancer drugs used to treat eye melanomas, such as treosulfan and gemcitabine.